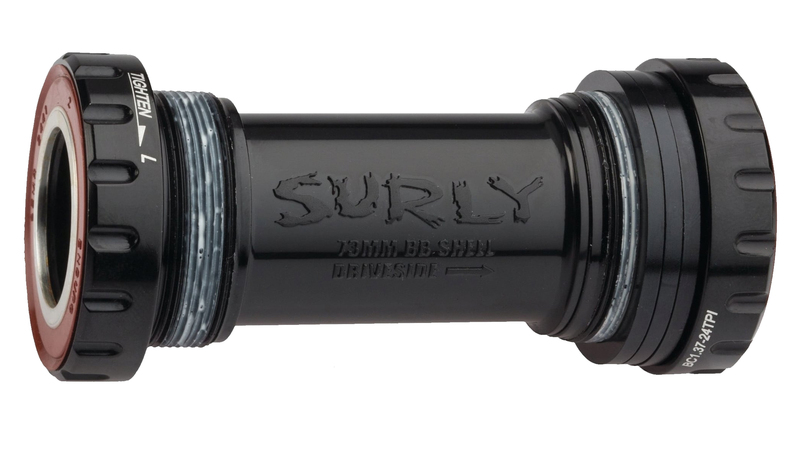 The Surly O.D Bottom bracket is designed to work with the Surly O.D. cranksets and comes in four types to suit your specific build. Choose from external cups only, 73mm, 100mm, and 100mm Moonlander specific options. Enduro brand bearings have double labrynth seals which shed trail muck and debris of all types. A 16-notch external bottom bracket tool and grease will be required for installation. I've been riding a bike with this bottom bracket for 3 years in snow, salt and dust. It didn't develop creaking or a loose feeling. Bought a spare but I don't think I'll use it for years. Bought this for my Surly ECR. Replacing the bottom bracket is easy, and JensenUSA shipped it to my door lickety-split. Replaced my bottom bracket for my surly moonlander.